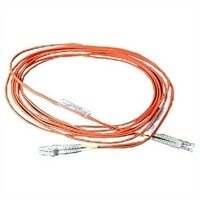 Dell 5 M LC-LC Multimode Optical Fibre Cable (Kit)Transfer data at high speeds with the Multimode LC/LC Fiber Cable from Dell. This cable features LC connectors at both the ends. It measures 5m in length, and is ideal for applications where minimum signal loss is an important consideration. This product has been tested and validated on Dell systems. It is supported by Dell Technical Support when used with a Dell system. Transfer data at high speeds with the Multimode LC/LC Fiber Cable from Dell. This cable features LC connectors at both the ends. It measures 5m in length, and is ideal for applications where minimum signal loss is an important consideration. This product has been tested and validated on Dell systems. It is supported by Dell Technical Support when used with a Dell system.